That’s what the San Francisco based band “The Tubes” asked us in 1975. In their song “What Do You Want From Life?”, The Tubes lead singer Fee Waybill proclaimed that “If you’re an American citizen, you are entitled to a heated, kidney-shaped pool…a foolproof plan and an airtight alibi…a year’s supply of antibiotics…a Maverick, a Mustang, a Montego…a Las Vegas wedding and a Mexican divorce.” This was his criticism of the materialism of modern society. 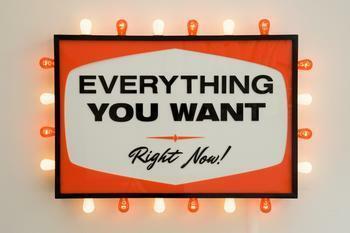 If I’m being honest, I have to confess to having a long list of “wants” – selfish things that would only benefit me. All things considered though, even in the lean times, I can say I’ve never been truly in need of the essentials. To come across a person who IS in need of those essentials is always a pin prick to the conscience. We used to take trips to the Carnegie Science Center in Pittsburgh when our boys were younger. After one of those visits, we literally spent the last of our money exiting the parking garage. As we got in line with traffic to merge onto the highway to head home, we saw a man at the top of the on-ramp walking from car to car asking for something. I automatically assumed he was panhandling. Since we didn’t even have any change in our ashtray, I prepared to politely dismiss his request and drive on. The man came up to my open window. He looked parched and his voice was hoarse as he asked “Do you have any water sir?” I was confused for a moment. Did he just ask for water? Our sons shocked me back to reality when they shouted “Hey Dad – we can give him our water!” I blinked and said “Yes. I can give you water” (I always carry a gallon of water in the van in case of engine overheating or emergencies). The boys reached into the back and retrieved the gallon jug which was still cold from sitting in an underground garage. They passed the jug to me and I handed the gallon of cold water out the window and to this man. We all watched as he stared in disbelief at the jug. He reached in the window and hugged me after which he began to leap in the air while holding the jug over his head shouting “Thank you, thank you Jesus, praise God!” over and over again. He was smiling and holding out the jug to show all the passing cars as we drove away. I guess God doesn’t ask us to give what we don’t have, but only to give what He has provided for us to use as a blessing for others. I never considered that the gallon of water in the back of our van could be such a blessing. It cost less than a dollar and had nothing to do with all the things I wanted from life. Maybe I wanted the wrong things, or maybe I wanted those things for the wrong reasons. The dark skinned man from another country who stood in my path on a highway onramp in Pittsburgh taught me something about assumptions and motives and showed our sons how God’s providence plays out and how true thankfulness and joy should be expressed. Maybe it’s not about what I want from life, but really about what life wants from me. This entry was posted in Uncategorized and tagged Americans, Assumptions, Blessing Others, Carngie, Christian Living, Driving, Faith, Fee Waybill, Ford Maverick, Ford Mustang, God, In Need, Joy, Las Vegas, Lessons Learned, Life, Mercury Montego, Motives, Panhandling, Parenting, Pittsburgh, Providence, San Francisco, Science Center, The Tubes, Water. Bookmark the permalink.